Thread: Art quilters, please help: how can I fix this quilts? I think you've looked at it too long! It is lovely. I love it. In my art training, every corner needs to be different. You have that I'm not an art Critique, by any means, but it is really, really pretty. I've never attempted an art quilt and say yours is gorgeous. It looks wonderful to me. So pretty and such a great execution of a wonderful idea. 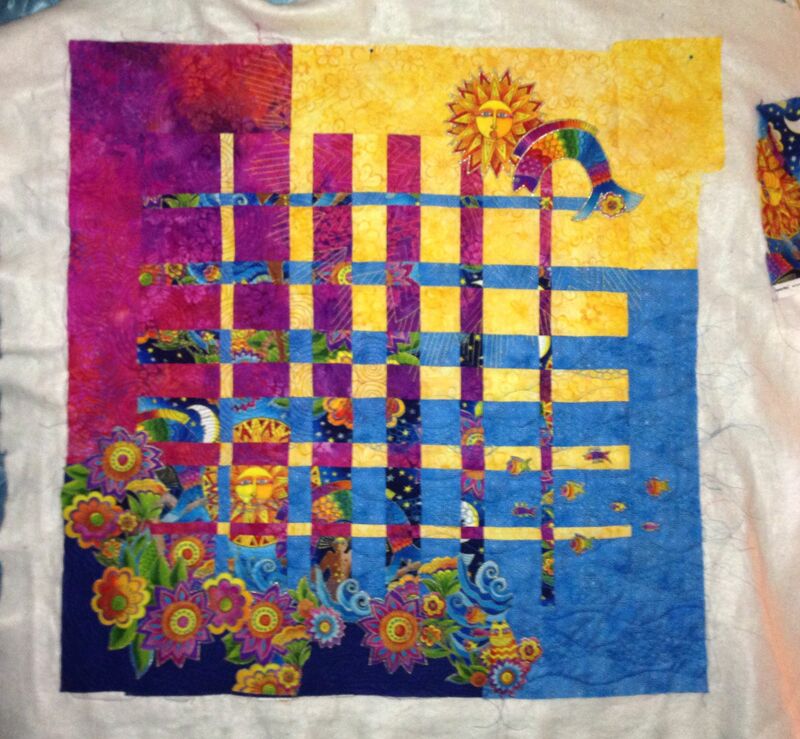 If YOU don't think it's "done" yet ... instead of looking at "what more can I quilt", perhaps consider embellishing with glass beads, buttons, embroidery stitches, dangling bits of fabric ... whatever. Think beyond the thread. Really, you are doing just fine. I like what you have done with your quilt! I think all it lacks is a frame. I would use either a dark blue or the purple/pink batik to do a 1/2 binding. You can "fix it" by sending it to a new home...MINE!!! It is gorgeous and I can't think of anything more to do to it except hang it and enjoy it! Good work! I don't see anything in need of fixing! It is just beautiful! Maybe bead or button centers in the flowers. Thread painting could also be used there. It is a beautie. Less is better! I think it's pretty great the way it is. I would extend the small flowers more in the lower right. Thee lower right looks a bit unbalanced. Just a few to fill some of the bank space. This is how I would comment if the piece was being judged. I believe this would give it more overall balance. IMHO it needs a border. Something dark...a blue perhaps? 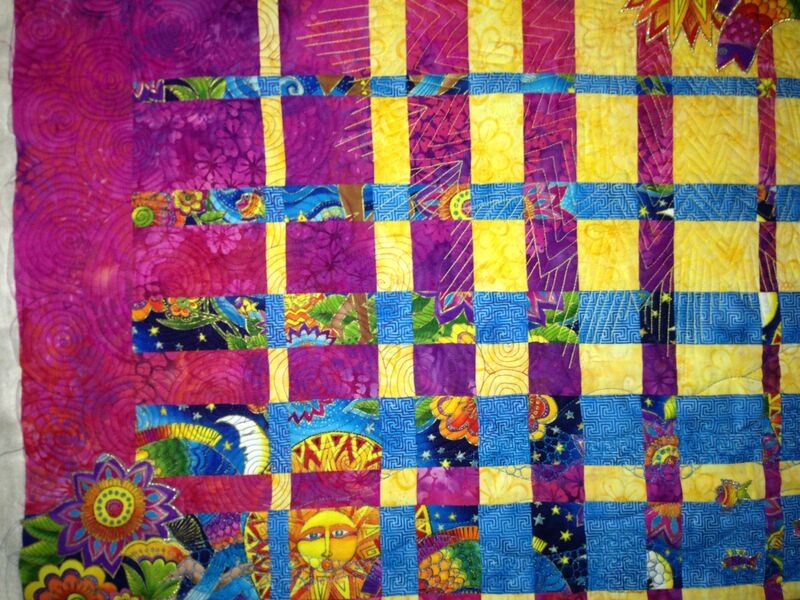 Otherwise the amount/style of quilting is just right. I think it's gorgeous as is. It doesn't need a thing added to it. LOVELY quilt!! IMHO I would add a border -- something dark. I had plans to do a binding with a dark batic (which is the backing). Hadn't thought about another border, tho. I'll play with that and see how it feels. DogHouseMom also suggested other kinds of embellishments -- I think I"ll play around with that idea too. All I can say is WOW!. 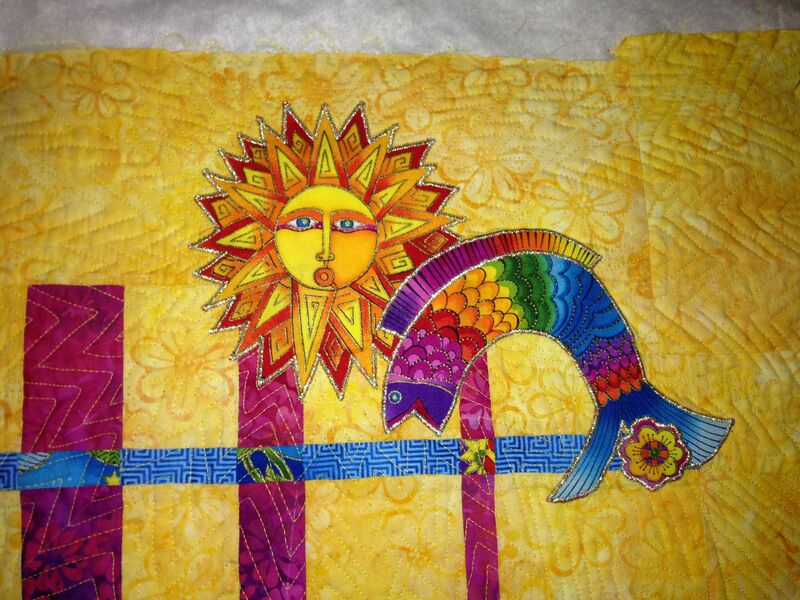 I noticed the quilting stood out more in the upper left hand corner than it did in the lower right hand corner. Maybe that's what is tugging at you. Both have not applique, which I think is nice, so I wouldn't applique anything in the blue corner, although that was my first though. 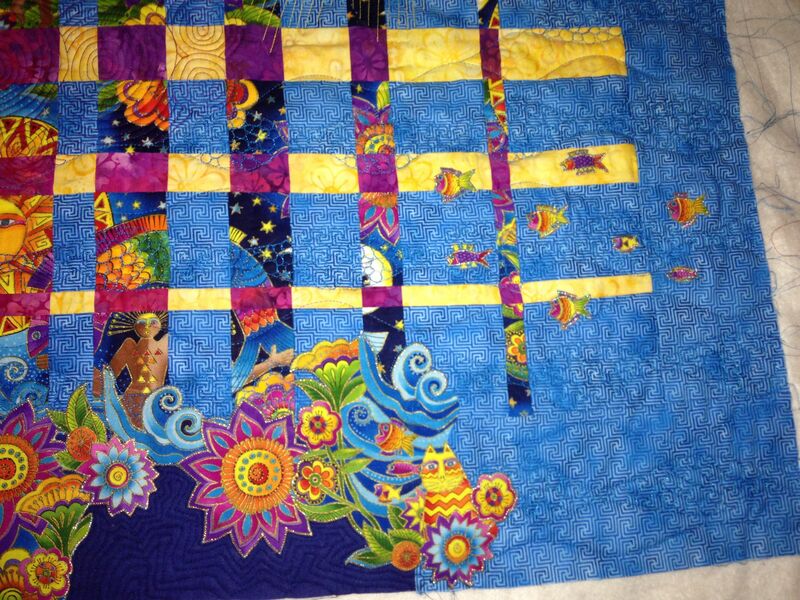 Perhaps a quilting patter that is tighter and in a more contrasting thread that what you have used? The thread and quilting really stand out in the upper left. Perhaps that could be echoed in the lower right. You have done a marvelous job!